Platinum and palladium advanced for a third straight session Wednesday, with palladium also extending its streak to three in a row for record settlements. Gold and silver, meanwhile, ended lower in normal hours and then gained later in electronic trading following the release of the Fed’s latest monetary policy statement. Gold for April delivery shed $4.80, or 0.4%, to settle at $1,301.70 an ounce on the Comex division of the New York Mercantile Exchange. Gold futures ranged from a low of $1,301.20 to a high of $1,308.50. They rose 0.4% on Tuesday and slipped 0.1% on Monday. In electronic trading after the Fed news, gold prices moved toward $1,315 an ounce. 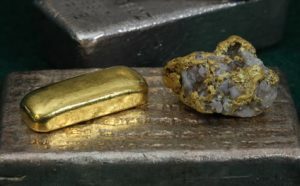 "Gold prices also hit a three-week high, post-FOMC," Jim Wyckoff, a senior analyst at Kitco Metals Inc., said in a daily note. "The metals are lifted by a surprisingly more dovish tone coming from the FOMC statement that was just released." Silver for May delivery declined 5.4 cents, or 0.4%, to close at $15.318 an ounce. Silver futures traded between $15.26 and $15.39. They gained 0.3% on Tuesday and shed less than a half cent on Monday. The precious metal was last near $15.50 an ounce in after-hours trading. April platinum settled up $7, or 0.8%, to $859.60 an ounce, ranging from $850.40 to $867.40. Palladium for June delivery gained $8.50, or 0.6%, to $1,560.40 an ounce, trading between $1,548.30 and $1,565.50. Gold declined $4, or 0.3%, to $1,303.70 an ounce. Silver fell 9 cents, or 0.6%, to $15.32 an ounce. United States Mint bullion sales rose with gains of 500 ounces in American Platinum Eagles and 500 ounces in American Gold Buffalos. Below is a sales breakdown of U.S. Mint bullion products with columns listing the number of coins sold during varying periods.